This week's Beer of the Week is from a P.E.I. 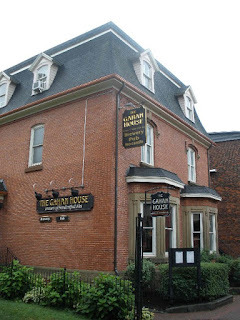 brewery that I have featured before, The Gahan House. This was given to me from my buddy, Dave, at work who had a friend bring some home from Charlottetown, as he does not like fruity beers. Gahan House Brewpub is named after John Gahan, a local merchant, who built the building which the brewpub is currently occupies in 1880. In 1922, the building was purchased by the Roman Catholic Episcopal Corporation and used as a convent until sometime in the 1960s, when it became a boarding house. The brewery was started in 1997 as Murphy's Brewery in another location. Their beer was popular so in November 2000, the company bought the old Gahan House, and renamed the brewery Gahan Brewery, where it doubled its capacity and also became a brewpub. Our friends, Alfred and Christine, ate there a few years ago and said the food was delicious. This should be a very healthy beer as it is known that blueberries are full of goodness. They contain antioxidants, which help fight off cancer, cardiovascular disease and other age-related conditions. They also are a good source of vitamin K, vitamin C, manganese, fiber and copper. Gahan describes the Blueberry wheat ale as an unfiltered white ale featuring blueberries from Atlantic Canada. Offering a hint of great aroma and sweetness of wild blueberries - not too sweet - just right! The beer pours a cloudy golden colour as it is an unfiltered ale. Teena, who is assisting me in this tasting, and I both noticed the presence of blueberries in the aroma. I found when I sipped there was not the usual wheat beer feel to this. It starts a little sour with blueberries coming in through the finish. Teena found that although it had blueberries in the aroma, she missed them in the taste but found what she described as an "outdoor freshness" in the finish. A nice ale that we both would have again.